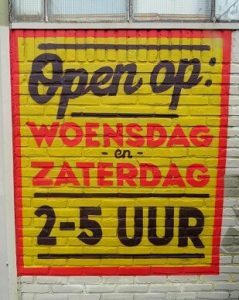 Weggeefwinkel Utrecht is open every wednesday and saturday from 2:00 PM to 5:00 PM. The Solidarity Fridge is always accessible: 24 hours a day, 7 days a week. We are lo­ca­ted at 2de Daalse­dijk 2a in Utrecht (close to the rail­way via­duct over the Am­ster­­­dam­se­­­straat­weg). Our bank account number is NL13 TRIO 0379 2093 73 in the name of ‘Weggeefwinkel’. Do you want to stay informed? Follow us on Facebook (Dutch). 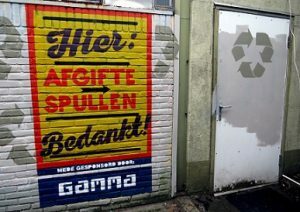 You can bring in goods at the right side of the Weggeefwinkel. Look for the sign that says “afgifte spullen”. Apart from opening hours, you can bring in goods on Tuesdays and Thursdays from 2.00 PM to 5.00 PM. Placing food in the Solidarity Fridge is always possible. The fridge is located outside of the Weggeefwinkel, next to the sign “afgifte spullen”.